High Quality Content by WIKIPEDIA articles! The Velo-Dog was a pocket revolver originally created in France by Charles-François Galand in the late 1800s as a defense for cyclists against dog attacks. The name is a portmanteau of "velocipede" and "dog". Surviving examples vary considerably in appearance, but all have certain features in common. 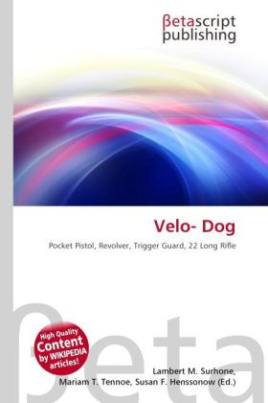 All have short barrels and fired the 5.75 mm (.22 calibre) Velo-dog cartridge. The hammer is shrouded to avoid its snagging on clothing, so the weapon is double action only. Another unusual feature is the lack of a trigger guard and a trigger that folds into the body of the gun when not in use.